CASCADE TEK's hi-vac ovens are fully automated, hi-vac drying ovens built to execute your unique bake-out or drying process. Ideal for space/flight hardware, connectors, or any vacuum process requiring vacuum ranges between 1 x 10-4 to 10-7 torr. Our thermal platen allows temperatures from -100°C to 220°C. CASCADE TEK integrates the appropriately sized roughing pump (dry or wet) and turbo-pump to minimize process time. 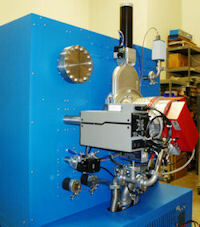 CASCADE TEK's control system is designed for simple push button execution of your vacuum drying process. Simple, touch screen control automates the opening/closing of the vacuum valves, temperature profiles, nitrogen purging and vent sequences. Vacuum levels are displayed digitally with full measurement ranges in mTorr & Torr. Independent overtemp protection serves as a failsafe for your product inside the oven. 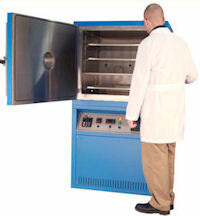 Software provided allows for easy modifications should your vacuum oven drying process change over time. CASCADE TEK can install multi-channel datalogger that displays temp, vacuum and even part temperature(s) during the vacuum drying process. In a clean room, Remote viewing allows the operator to watch the action without having to "suit-up". CASCADE TEK's hi-vac ovens are made in the USA. For additional information about our company, products, and services, please visit our website below or call us.